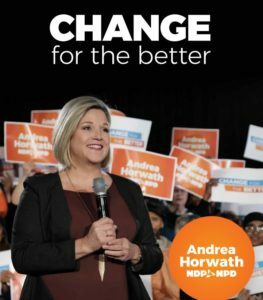 Today, Andrea Horwath released the Ontario New Democratic Party’s platform for the June 7th provincial election. Caught between the determined leftward shift of the Wynne Liberals, and the upsurge in attention generated by the late-breaking selection of Doug Ford as PC leader, the NDP was at risk of being crowded out in the lead-up to this election campaign. Instead, today’s platform is the opening salvo in an NDP campaign with a clear path: take advantage of the opportunity created by highly polarizing Liberal and PC leaders to convince Ontario voters to entrust Horwath to lead the first NDP government in Ontario since 1995. 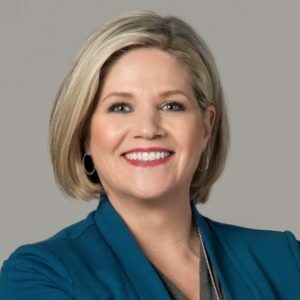 Under the slogan, “Change for the Better,” Horwath is tapping into the strong desire for change in Ontario that has been dogging the Kathleen Wynne Liberals after 15 years in government. The platform frames Horwath’s NDP as an alternate choice for change, positioning it as a populist, yet progressive alternative to Doug Ford’s PCs. The NDP aim to shore up the party’s blue-collar roots through a series of workers-first policies. Tackling the shortcomings of her 2014 campaign head-on, Horwath and the NDP are re-focusing on progressive, pocketbook issues, like $12-a-day child care. The platform focuses on making life more affordable for everyday Ontario families with initiatives such as dental care and pharmacare, student debt relief and reductions to hydro rates. The NDP platform is projecting lower deficits than those outlined in the recent Liberal budget, a feat made possible by the NDP’s plan to introduce a number of significant new or increased taxes targeting business and high-income earners. Make Ontario the first province with universal pharmacare by 2020. Provide all Ontarians and their families with decent dental benefits, by setting a minimum standard of essential dental coverage. Extend public dental coverage to every senior without retiree benefits, and to every person on social assistance. Take immediate steps to expand hospital capacity — starting with funding for 2,000 hospital beds now. Restore hospital funding and ensure it keeps pace every year with inflation, population growth, aging and the unique needs of communities. Funding will increase immediately by 5.3%. Invest at least $19 billion over 10 years in hospital capital expansion to meet growing capacity needs. This includes ending oversupply. The NDP will cancel the Liberals’ borrowing scheme that adds billions in new debt to finance short-term bill reductions. Double the support for low-income families who heat with electricity by doubling the Ontario Electricity Support Program’s benefit. From now on, every student who qualifies for OSAP will get a nonrepayable grant instead of a loan. Retroactively forgive student loan interest owed or paid to the province by any student or past student who still holds a provincial loan. Foster 27,000 new work-integrated-learning opportunities like co-ops or paid internships for students. End a corporate income-tax giveaway, returning the tax rate on profits to 13%. Bring in a uniform Business Education Tax rate and continue the Education Tax Reduction Plan, adjusted to equalize rates. Introduce a luxury tax of 3% on cars sold for over $90,000. Tax tobacco based on value, ensuring that as tobacco prices go up, the taxes fairly reflect the value. Introduce an affordable child care plan that has an average cost to families of $12/day. Increase the minimum wage to $15 for everyone and index it to inflation. Cover 50% of operating costs for municipal transit. Provide two-way all-day GO rail service between Kitchener— Waterloo and Toronto and establish year-round GO rail service between Niagara and Toronto. Bring down auto insurance premiums by 15%. As with any party platform, the fine print is important. This is especially true when comparing the promises made by the NDP with the recent investments made in the Liberal government’s 2018 Budget. In preparing its platform, the NDP chose to build its fiscal plan in addition to the spending forecast in the 2018 Ontario Budget – but without including (unless otherwise stated) – any new commitments made by the government in the Budget. In other words, unless specifically mentioned in the NDP platform, any spending announced by the Government in the recent budget will be rolled back should the NDP win power. While several of the NDP commitments exceed investments already made or proposed by the Liberal government, others represent a significant reduction on priorities identified by the Liberals – including funding for developmental services and transit. With this platform, Horwath looks to unite the progressive vote and reclaim voters who were lost to the Liberals in 2014. Can Horwath translate her high personal approval ratings into support for “Change for the Better”? Can she emerge as Doug Ford’s main competition? There’s only 52 days until we find out.